Republican presidential front-runner Donald Trump just received his first endorsement from a member of the U.S. Senate: Alabama's Sen. Jeff Sessions. 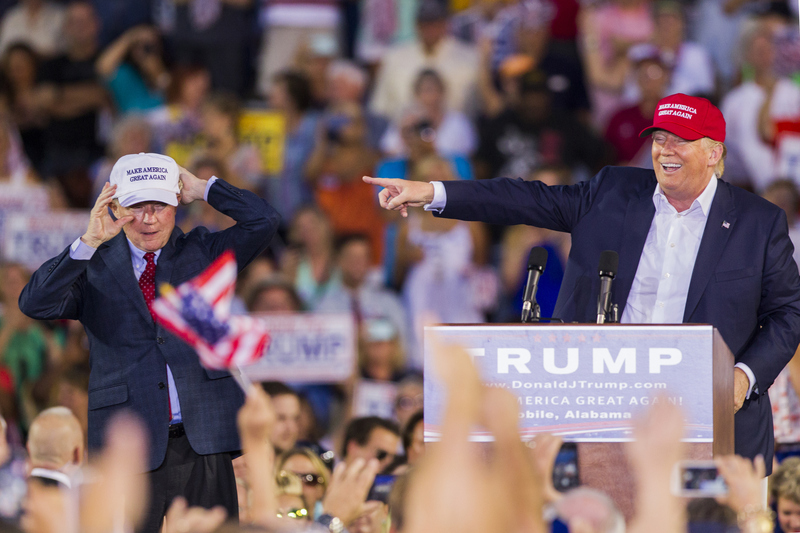 "I am pleased to endorse Donald Trump for the president of the United States," Sessions said at a Madison, Alabama rally, standing next to Trump while sporting the billionaire's signature "Make America Great Again" hat. "There is a movement afoot that must not fade away." "There is an opportunity this year. Tuesday," Sessions said, referencing Alabama's upcoming Republican primary on Mar. 1. "We have an opportunity here -- it may be the last opportunity we have for the people's voice to be heard." Sessions, who is widely considered to be one of the most conservative members of the upper chamber, praised Trump as a candidate "committed to leading this country in an effective way." "Nobody is perfect," Sessions continued. "We can't have everything, can we, Mr. Trump?" But, he added, "In my opinion, in my best judgement, we need to make America great again." In a longer statement emailed out by the Trump campaign on Sunday, Sessions laid out his reasoning further and striking a populist tone: "Trump alone has rejected the donor class, defending America's jobs and wages from open borders, uncontrolled immigration and the massive Trans-Pacific Partnership that will cede U.S. authority to foreign powers," he said. "Trump's trade and immigration plans will revitalize our shrinking middle class, keeping jobs and wealth and income inside the United States of America." Introducing Sessions at the rally, Trump said the senator was "the expert, as far as i'm concerned, on borders." "We want strong borders," he added, "We want the wall." Since his overwhelming wins in early-voting states this month, Trump has collected several Congressional and gubernatorial endorsements, including a nod from former rival New Jersey Gov. Chris Christie just last week. The reality television star also recently earned the backing of a controversial white nationalist figure, former Ku Klux Klan grand wizard David Duke, who Trump has refused to condemn. What did Donald Trump say about the KKK? Support from the Alabama senator may not come as a surprise for those who have watched Trump's rise closely. Sessions was spotted wearing a "Make America Great Again" hat at a rally in August, and he has previously espoused support for the New Yorker's immigration proposals. In the past, however, Sessions has vouched for Trump's rival -- Texas Sen. Ted Cruz -- when it comes to Cruz's position on amnesty for undocumented immigrants. When Cruz's opponents tried to paint the Texas Republican as a supporter of a path to citizenship for illegal immigrants, Sessions defended Cruz as one of the key blockers of the 2013 "Gang of Eight" immigration reform bill, unpopular with some conservatives as pro-amnesty legislation. "I think I can say this with integrity and good judgement: I believe without the vigorous opposition of Ted Cruz, this bill likely would have passed," Sessions said last year. "So we need to thank him." The announcement comes just as Alabama voters prepare to cast their ballots in the Republican primary, scheduled as one of Super Tuesday's slate of nominating contests.